Ailing national carrier, Air Zimbabwe has reportedly given its fleet a much-needed facelift. This re-branding exercise follows a long-term lease agreement signed between Air Zimbabwe and Malaysian Airlines. This agreement will see Air Zimbabwe (now Zimbabwe Airways) taking delivery of four 12-year-old Boeing 777-200 planes from Malaysia Airlines. This deal follows the controversial appointment of Simba Chikore the son – in – law of President Robert Mugabe as CEO of Air Zimbabwe. Sources from the airline say the agreement was spearheaded and signed by the newly instated C.E.O Simba Chikore as part of the airline’s turnaround strategy. Air Zimbabwe which is the flag carrier airline of Zimbabwe has been in a downward spiral since 2003 when it was reported that the carrier was struggling financially. In February 2004, it was revealed that the company had been temporarily suspended by International Air Transport Association (IATA) over unpaid debts. To date, it is assumed that the airline has a debt in the excess of USD$300 million. In recent years Air Zimbabwe become notorious for corruption and poor service delivery which resulted in passenger numbers falling from 1 million in 1999 to less than 20,000 in 2015. The airline is also reported to have retrenched over 300 employees in a bid to cut overhead costs and continue operations. Air Zimbabwe which was last month banned from flying into Europe has been using 1 Xian MA60, 2 Boeing 737-200Adv, 1 Boeing 767-200ER and an Airbus A320-200 which the European Union consider “unsafe”. Earlier this year, the airline received much criticism on social media after it was leaked that they were issuing handwritten boarding passes to passengers. Images of the airline’s new look have been going viral on social media with most of the feedback regarding the rebranding being positive. 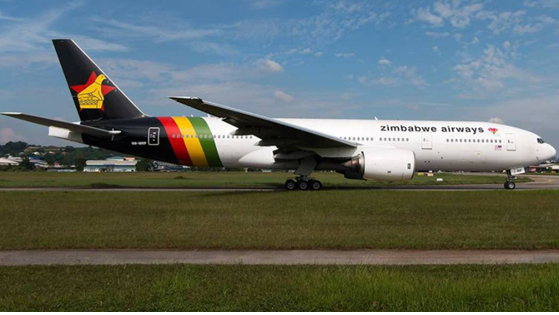 The new rebranded planes have a black tail featuring the Zimbabwe bird, preceded by 3 strips (green, yellow and red). A source from the airline says that the rebranding of the airline will go beyond the superficial aspects but will see the airline improve their operational and service strategies. The new Zimbabwe Airways seeks to regain the confidence of its customer and stakeholders.